Jacques Hnizdovsky was born in Ukraine in 1915 and studied art in Warsaw and Zagreb. He had an early interest in the woodcut, particularly those of D?nd the Japanese. Shortly after he arrived in the United States in 1949, A. Hyatt Mayor of the Metropolitan Museum of Art chose one of his woodcuts for a Purchase Award at a 1950 Minneapolis Institute of Art print exhibition. It was a turning point in his career and his life. From that moment he was determined to make his livelihood as an artist. By the end of the 1950s he had settled into the woodcut as his primary medium. In 1962 he was awarded First Prize at the Boston Printmakers annual exhibition. 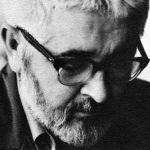 He was invited to participate in the Contemporary U.S. Graphic Arts exhibition which traveled to the USSR in 1963, as well as a similar exhibition to Japan in 1967. His woodcuts were included in the Triennale Internazionale della Xilographica in Italy in 1972. In 1977 shows of his woodcuts were held at the Long Beach Art Museum, California, and Yale University, and in 1978 and 1982 at the University of Virginia and at the Hermitage Museum of Norfolk, Virginia, in 1981. He received a Tiffany Fellowship in 1961, and fellowships from the following: MacDowell Colony in 1963, 1971, 1976, 1977; Yaddo Foundation in 1978; Ossabaw Foundation in 1980; Virginia Center for the Creative Arts in 1979, 1981, 1982, 1983, and 1984. In 1975 a catalogue raisonn頯f his woodcuts Hnizdovsky Woodcuts 1944 – 1975 was published by Pelican Publishing Co. of Gretna, Louisiana. In 1987 an updated version Jacques Hnizdovsky Woodcuts and Etchings was published, including all graphic works made during his lifetime. Hnizdovsky has contributed illustrations to The Poems of John Keats, 1964; The Poems of Samuel Taylor Coleridge, 1967; Tree Trails of Central Park, 1971; Flora Exotica, 1972; The Poems of Thomas Hardy, 1979; The Traveler?s Tree, 1980; The Poetry of Robert Frost, 1981; Signum Et Verbum, 1981; A Green Place, 1982; Birds and Beasts, 1990; Behind the King?s Kitchen, 1992; and The Girl in Glass in 2002. The Addison Gallery of American Art, Andover, Massachusetts; The Burnaby Art Gallery, British Columbia; The Butler Institute of American Art, Youngstown, Ohio; The Chrysler Museum at Norfolk, Virginia; The Cleveland Museum of Fine Arts; The Davison Art Center, Wesleyan University; The Duke University Museum of Art, Durham, North Carolina; The Dulin Gallery of Art, Knoxville, Tennessee; The Hunt Institute for Botanical Documentation, Pittsburgh; The Henry Art Gallery, University of Washington, Seattle; The Lauren Rogers Museum of Art, Laurel, Mississippi; The Louisiana Arts and Science Center, Baton Rouge; The Louisiana State Museum, New Orleans; The Minneapolis Institute of Arts; The Mississippi Museum of Art, Jackson; The Museum of Fine Arts, Boston; The National Museum of American Art, Washington, DC; The New Orleans Museum of Art; The New York Public Library; The Philadelphia Museum of Art; The Tweed Museum of Art, University of Minnesota; The U.S. Information Agency, Washington, DC; The Library of Congress and The White House, Washington, DC; The University of Delaware; The Virginia Museum of Fine Arts, Richmond; The Winnipeg Art Gallery and Yale University. Jacques Hnizdovsky died on November 8, 1985. Copyright © 1985-2006 S. Hnizdovsky. All rights reserved.